In Lori Foster's Buckhorn Ever After, the last thing Nadine Moest wants is to be the latest notch on gorgeous ranger Shohn Hudson's bedpost. But Shohn is determined to win her trustand her heart. 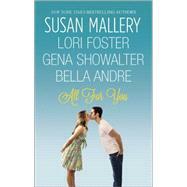 Kenna Starr will do anything to overcome her bad-girl past in Gena Showalter's The One You Want. Dane Michaelson is exactly the kind of guy she needs to avoid, but he's used to getting what he wants, and he wants her. Noah Bryant and Colbie Michaels are meant to beat least, that's what he thinks when they keep serendipitously meeting. Now he just has to convince her they're destined for each other, in Bella Andre's One Perfect Night.